Paper - West, I.M. 1979 Review of Evaporite Diagenesis in the Basal Purbeck Formation of Southern England. West, Ian M. 1979 [reproduced 2013]. Review of Evaporite Diagenesis in the Purbeck Formation of Southern England. Internet site: http://www.southampton.ac.uk/~imw/Papers-West-Review-Diagenesis-1979.htm. Version: 3rd April 2013. This an old paper written by this webpage author in 1979 and is here in original form, without updating. 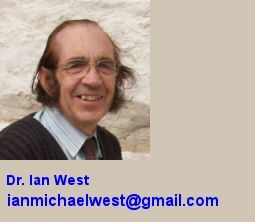 It ia a supplement to the various webpages on the Geology of the Wessex Coast. See other webpages below for updated information and local details of the Purbeck Group or Purbeck Formation. Note "Spongiostromata-type stromatolites" should be replaced throughout to "thrombolites" which is the correct modern term. Purbeck - Durlston Bay - Lower Purbeck Formation. Purbeck - Formation - Geological Bibliography - Topics, Alphabetic. Purbeck - Portesham Quarry, north of Weymouth. Purbeck - Poxwell Quarry, east of Weymouth. By Ian M. West, 1979. A.S.F. Publication Speciale, No. 1, Mars [March] 1979. pp. 407-416. Evaporites and remains of "vanished evaporites" are widely distributed in the Purbeck Formation [Purbeck Group] of southern England [Dorset]. Associated sediments show that these were formed in semi-arid conditions on the extentive tidal-flts of a shallow hypersaline gulf. the primary sulphate was predominantly gypsum as lenticular crystals. Fabrics developed indicate five major stages of diagenesis. There was early recrystallisation of the initial gypsum mush (stage 1) to an anhedral fabric with the small-scale "net-texture" (stage 2), a process which commenced penecontemporaneously and was completed before deep burial. The anhydrite was recrystallised so that several anhydrite fabrics now exist. Hydration, a relatively recent process resulting from contact with meteoric water near the surface, usually proceeded via a stage (4) of anhydrite with gypsum porphyroblasts [porphyrotopes]. The existing porphyroblastic [porphyrotopic] gypsum represents the final stage (5). Concurrent with sulphate diagenesis there was replacement of the evaporites on an appreciable scale, particularly where they were not enclosed in impermeable clays. Calcitisation has produced peculiar limestones and breccias. Associated replacment products, including celestite, calciostrontianite, lutecite, quartzine and quartz, suggest an inorganic mechanism for the calcitisation. Criteria are listed that may be used for the recognition of similar replaced evaporites elsewhere. The Purbeck Formation underlies much of southern and southwestern England (see Howitt, 1964, for isopachyte map) and parts of the Channel (Larsonneur et al., 1974). It consists mainly of of limestones and clays that originated in shallow waters of various salinities ranging from fresh to hypersaline. These sediments are the products of a widespread regression at the end of the Jurassic Period. Evaporites are only common in the lower part of the formation [Purbeck Group], but for palaeoclimatic reasons there are only traces in the middle Purbeck (El-Shahat, 1977) and none in the upper. The evaporites, attaining about 12m in thickness in some areas, occur most widely at the base of the formation. Anhydrite found in boreholes is associated with pelletal and algal limestone and occasionally dolomite (see Howitt, 1964; Shearman, 1966; Taitt and Kent, 1958; Holliday and Shephard-Thorn, 1974). In the shallow subsurface at the Mountfield and Brightling gypsum mines in Sussex four "seams" or beds of gypsum occur, the evaporite facies commencing almost exactly at the base of the Purbecks. Some chert and some celestite (James in Howitt, 1964) is present. When these basal evaporitic beds are exposed at the surface in Dorset, they are extensively calcitised and brecciated (Hollingworth, 1938; Brown, 1964; West, 1964). The main evaporite facies here is interbedded with strata that originated in less hypersaline, intertidal, conditions (West, 1975). Algal limestones are common (Brown, 1963; Pugh, 1969). At higher horizons in Dorset, in the Soft Cockle Beds [Soft Cockle Member, of the Lulworth Formation, i.e "Lower Purbecks" but higher than the basal unit], there are evaporites consisting of secondary gypsum. Occurring in a more argillaceous sequence (see Clements, 1969 and reprinted in 1993, for details of the succession in Durlston Bay) they are mostly unreplaced. On the Isle of Portland, however, there are celestite, quartz and chalcedony replacements [exposed in the western cliffs of Portland at the level of the Portland Alabaster, the Portland gypum, not normally seen at the surface]. The British Purbeck evaporites have been formed in and around a very large, very shallow, lagoon with extensive tidal-flats. Size and hypersalinity accounts for lack of bioclastic debris. An important feature of the evaporites is the evidence of semi-arid conditions (West, 1975). They are associated with the remains of trees, perhaps of a rather southern (35 degrees N.?) type of forest-steppe (Walter, 1973), and with thin, black carbonate-rich soils, once compared to chernozems (Damon, 1884), but probably rendzinas. Occasionally there are thin freshwater beds. There are no blown sands, red beds or beds of halite which could have originated in desert conditions. The evaporites consist predominantly of calcium sulphate and its replacement and occur in a grey mudstone and limestone sequence. They thus resemble other ancient evaporites of semi-arid origin such as the famous Palaeogene gypsum of Paris. 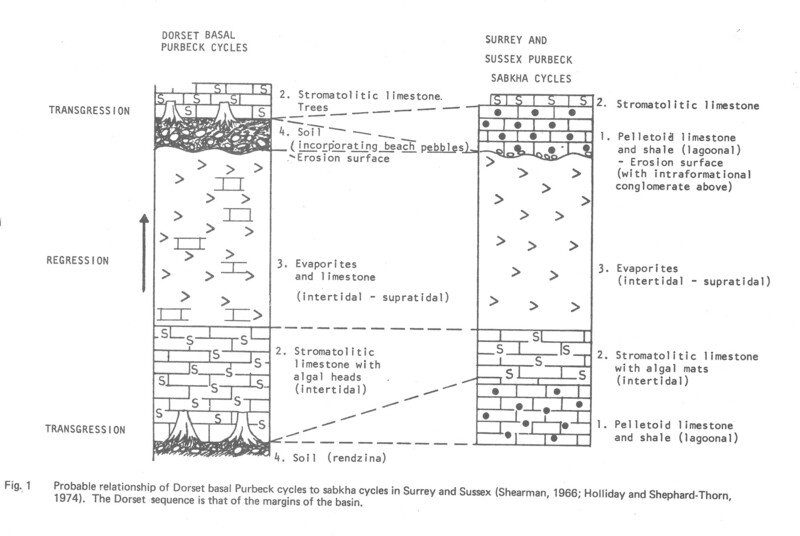 Cycles of sedimentation were reported in the basal Purbecks in the east at Warlingham by Shearman (1966) and later at Fairlight and Brightling by Holiday and Shephard-Thorn (1974). These authors compared the cycles to modern sabkha cycles of sedimentation and diagenesis formed by alternating transgression and progradation on coastal flats bordering deserts. It must be stressed, however, that the semi-arid nature of the Purbeck environment has resulted in some special features. It is in the basal Purbecks of the Dorset marginal areas that cycles with evaporites have, at the top, soils with trees (West, 1975). Such soils would presumably be absent in typical desert sabkha cycles. These cycles and the sabkha cycles of the region to the east are compared in Fig. 1. Each cycle results from a rapid transgression which submerged a forest. It was followed by a long phase of sedimentation during which evaporites were formed. The soils are best developed where the proportion of carbonates to evaporites in the underlying rock is high and where local uplift has produced well-drained areas favouring growth of numerous conifers and scattered cycadophytes. Fig.1. Probable relationships of the Dorset basal Purbeck cycles to sabkha cycles in Surrey and Sussex (Shearman, 1966; Holliday and Shephard-Thorn, 1974). The Dorset sequence is that of the margins of the basin. Pseudomorphs, ghosts and the present sulphate textures have enabled the general diagenesis of the Purbeck evaporites to be established (West, 1964; West,1965). A broadly similar scheme, but with some changes, particularly subdivision of the anhydrite stage, has been put forward by Holliday and Shephard-Thorn (1974) for the Fairlight Borehole. Shown diagrammatically here (Fig. 2, above) is a modified, updated, scheme of West (1965). Descriptions of the diagenetic stages follow. Chert in evaporitic rocks of the Purbecks usually contain numerous minute (about 2mm or less) pseudomorphs of chalcedonic silica (usually lutecite) after lens-shaped crystals of gypsum. Sometimes these are quite separate and be studied in three dimensions. It can then be seen that these crystals had the lenticular habit well-known from the Paris Palaeogene gypsum (Lacroix, 1897). Even more abundant throughout most of the basin, but less well perfectly preserved are calcite and secondary gypsum pseudomorphs after early gypsum crystals of this type (West, 1964; Shearman, 1966; Holiday and Shephard-Thorn, 1974). The modern environments in which mushes of such minute lenticular crystals are found are those of arid or semi-arid tidal flats. Examples have been described from the Trucial Coast (Shearman, 1966), Texas (Masson, 1955) and elsewhere. Frequently visible in thin-sections of the evaporitic rocks is a small-scale (2mm) network of impurities such as calcite, clay, quartz and celestite (Fig. 3B). A similar texture in anhydrite of salt-dome cap-rock was named by Brown (1931) "net-texture". This microscopic feature should not be confused with the large-scale chicken-wire or nodular structure discussed below. Net-texture is found in Purbeck anhydrite and in secondary gypsum. It is common in calcite replacements and occurs in some early chert replacements of evaporites; all this suggests an early origin. 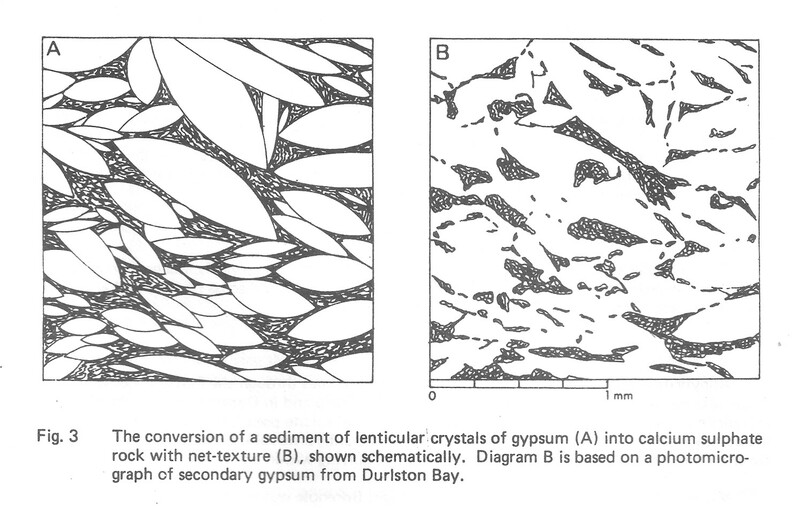 Net-texture was probably fixed in position during the compaction and crystal growth of the initial sediment of small lenticular crystals of gypsum (Fig. 3). This seems to have been converted into anhedral gypsum with reduced porosity; the carbonate and clay films between the crystals form the net-texture. Sometimes it is particularly conspicuous because calcitisation has been initiated on the network of carbonate nuclei. Some nodular structure may have developed from large gypsum crystals, the growth of which preceded conversion to anhydrite (Fig. 2). It is more appropriate to discuss nodular and enterolithic structures in relation to anhydrite. See stage IIIb, below. Anhydrite is the predominant evaporite in deep boreholes through the Purbeck Formation. It can also be found with gypsum in the Sussex mines. There and in Dorset minute relics of anhydrite are preserved in secondary gypsum; gypsum and calcite pseudomorphs after anhydrite are common (Brown, 1964). The origin of much of the anhydrite rock as gypsum is demonstrated by chert nodules with pseudomorphs after gypsum occurring within anhydrite. Microscopically, the anhydrite from the Fairlight Borehole was found by Holliday (1973; in Holliday and Shephard-Thorn, 1974) to occur as three main fabrics. He suggested that aphanitic anhydrite has given rise to anhydrite with felted-lath or fibroradiate texture by local recrystallisation. Lath-shaped anhydrite with cross-cutting relations to earlier fabrics was considered to be the latest fabric. Conflicting evidence, however, for the texture of the earliest anhydrite comes from Dorset. Here, chert nodules, presumably early since Purbeck chert predates compaction and tectonic fracturing, contain ghosts or pseudomorphs after fibroradiating or lath-shaped anhydrite (West, 1964). The texture of this early anhydrite is remarkably similar to that of the Recent anhydrite of the Trucial Coast (compare plate 36, fig. 3 of West, 1964, with plate 3, fig. 1 of Shearman and Fuller, 1969). Aphanitic anhydrite rather than being the earliest variety, may be, instead, a recrystallisation product of a coarser-grained "anhydrite", now mostly lost. Stage 111b � Nodular and Enterolithic Anhydrite Where net-texture is absent in anhydrite or later rep I acements,nodu lar'structu re ("macrocell structure" of West, 1965) or chicken-wire structure is usually developed. The nodules' consist, or consisted of, nearly pure calcium sulphate with displaced sediment occurring as stringers between them. They are often found as anhydrite in boreholes (Shearman, 1966; Holliday and ShephardThorn, 1974) or as secondary gypsum at the surface. Closely associated with nodular structure are enterolithic veins. The most common type shows small, tightly-closed, folds each of which consists of miniature domes and basins, swollen at crests and troughs. In argillaceous limestones there are some non-transgressive gypsum veins with cylindrical folds. A third type of vein is transgressive, cutting the other veins and, therefore, somewhat later (West, 1965). The nodules of sulphate have displaced the carbonate and clay as they enlarged. The closely related enterolithic veins provide evidence of expansion since the dome and basin structure can only have originated by such means. Crystal growth was presumably the mechanism, although whether initially as anhydrite � (III b) or as gypsum IIb), is a problem that is discussed below. The transgressive veins have been compared to ptygmatic structures formed by buckling as veins inject plastic country rock (West, 1965). Early origin of the nodules and veins is shown by their occurrence in anhydrite and by evidence of plastic deformation of the containing sediment (West, 1965). Shearman (1966), in a classic paper, pointed out the remarkable similarity of the Purbeck nodular anhydrite to the Recent nodular anhydrite which he described from the sabkhas of the Trucial Coast. 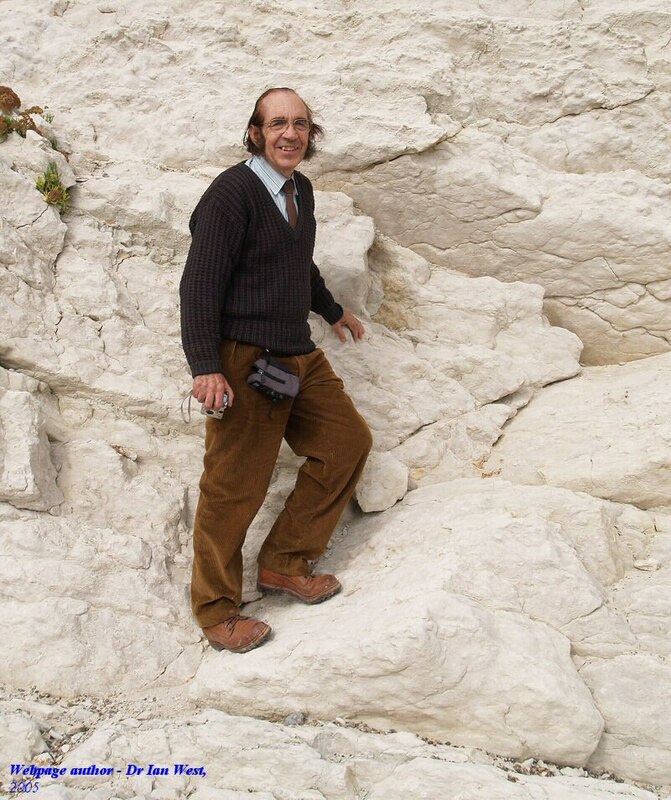 Shearman argued convincingly that the Purbeck nodular evaporites developed penecontemporaneously by crystal growth within the sediments of tidal flats. A further implication was that the Purbeck nodular anhydrite was of primary origin (Shearman, 1966). Evidence has already been put forward, though, for the initial sediment having consisted of gypsum (West, 1964; 1965) and that the nodules developed from this by the growth of gypsum crystals displacing impurities. This view was later to some extent supported by the discovery that the Trucial Coast nodular anhydrite had often developed from gypsum crystals (Kinsman, 1969; Butler, 1970). Nevertheless, Shearman has shown that the Recent nodules and veins have expanded as anhydrite and the increment, at least, is "primary anhydrite". There is no reason to doubt that the Purbeck nodules have also expanded as anhydrite, and, indeed, Holliday and Shephard-Thorn (1974) reported "primary" interstitial anhydrite from the Fairlight Borehole. It is, however, surprising that in this relatively northern semi-arid environment early anhydrite was developed. The climate was marked by great seasonal changes (West, 1975) and, perhaps, the summers were very hot and dry (Holliday, personal communication, 1977). In parts of the anhydrite rock, and in later replacements, nodular or enterolithic structures are predominant and these, then, represent the earliest development of anhydrite. The remainder of the evaporites show traces only of net-texture. Thus, after development of anhydrite nodules and veins there was conversion of the original gypsum mush through anhedral gypsum to anhydrite. This was presumably a consequence of both burial and time, since gypsum is rarely found at great depth (below 700m) in boreholes, and since primary gypsum is common in Cainozoic strata but rarely seems to survive in that of Mesozoic age. Anhydrite with porphyroblasts ("porphyrotopes" of Friedman, 1965) of gypsum occurs in the Sussex mines and elsewhere. The hydration of the anhydrite usually commenced with the growth of such crystals, hence their abundance in the secondary gypsum rock. Both nodular types (IVb) and types with net-texture (IVa) have been developed. The date at which hydration commenced at particular localities depended upon extent of erosion and access of meteoric water. � This type of gypsum rock formed from the anhydrite without nodular structure (stage IVa). The relict net-texture is seen as a network of small carbonate and clay particles. � This variety, of course, results from complete hydration of nodular (or enterolithic) anhydrite with gypsum porphyroblasts (stage IVb). The porphyroblasts have usually developed centripetally from the films of clays and carbonate around the nodules. The central area of each nodule is now occupied by alabastrine secondary gypsum (Holliday, 1970), consisting of small nearly equant gypsum crystals with interlocking boundaries. This is the consequence of the final, probably rapid, hydration. � Occasionally found is gypsum with relict net-texture but which is non-porphyroblastic. This was presumably formed by the direct hydration of stage IIIa anhydrite. � Fibrous gypsum is always extremely pure and, lacking relict textures, differs from the other types of gypsum by not being a replacement product. Instead it seems to show evidence of displacement; small fragments of limestone and shale have been lifted by the fibrous crystals. It cuts, and therefore postdates, the enterolithic veins. Even where the strata dip steeply as a result of Tertiary folding the fibres are consistently of vertical orientation suggesting that the formation of satin-spar postdated folding. Although therefore a fairly late sulphate development, satin-spar occurs in anhydrite rock buried to depths of about 400m (Holliday and Shephard-Thorn, 1974). It must represent some of the earliest gypsum formed when anhydrite rock was beginning to undergo hydration. An origin during hydraulic-jacking was suggested by Shearman et al. (1972). Evidence against this, however, is firstly the late development of satin-spar in folded strata not far beneath a plane of unconformity, and, secondly, strontium contents for satin-spar (average for 6 samples � 288 p.p.m.) much lower than adjacent gypsum (average for 7 samples � 1159 p.p.m.). This suggests an open system with regard to water during its formation. Furthermore it does not possess the usual columnar impingement texture of open veins (Spry, 1969). If crystal growth alone caused the displacement,much of the overall expansion of the bed of sulphate that results from hydration may be represented by this new pressure-resistant, non-porous fabric of vertically orientated fibres (West, 1965). The evidence above seems to support this origin. Extensively developed at the base of the formation in Dorset are peculiar limestones resulting from calcitisation of evaporites (West, 1975). Criteria used for recognising such formerly evaporitic rocks are given below. It is particularly pseudomorphs which demonstrate the origins of these rocks. Some are soft white porous limestones, crumbling like weakly-cemented sandstone; others are hard, laminated and coarsely crystalline; all are completely unfossiliferous. Calcitisation is often attributed to bacterial action (Holliday and Shephard-Thorn, 1974). Lack of sulphur in the basal Purbecks, however, and the presence of much celestite (Salter and West, 1966; West, 1973) suggests that in this case inorganic calcitisation by bicarbonate-bearing groundwater was responsible. This explains why calcitisation is best developed in the basal beds, where the evaporites were almost in contact with the underlying Portland limestones. Calcitisation took place both before and after the tectonic brecciation that resulted in the formation of the Broken Beds. Calcitised evaporites occur both as blocks in the breccia and as matrix. Remaining gypsum was removed in solution. Chert is preferentially developed in the evaporitic beds as nodules or as thin beds. It replaces only stages I, II and III. Certain early Purbeck environments probably resembled in water conditions some modern ephemeral lakes in Australia. These display great seasonal fluctuations of salinity and pH causing precipitation of gelatinous silica, a precursor of chert (Peterson and von der Borch, 1965). The selective replacement of Purbeck gypsum is probably consequent on locally lower pH values around the sulphate, when in contact with alkaline water with silica in solution. Photosynthesis by the Purbeck algae was probably a factor in the production of lagoon water of high pH. 3. Spherulites of the lutecite [oblique extinguishing] variety of chalcedony. 6. Net-texture, a small-scale relic of early gypsum, in limestone. 8. Coarsely crystalline limestones without skeletal debris (possible calcitised evaporities). 9. Small contortions that are not obviously of subaqueous slumping or other non-evaporitic origin. 10. Minute rectangular relics of anhydrite in quartz or other minerals. Such evidence is likely to be found in other formations without normal marine faunas but with features such as algal-mats, algal [thrombolite or ] stromatolite heads, caliches, abundant hypersaline ostracods or peculiar breccias. Obviously red-bed evaporites of more arid origin can provide additional criteria resulting from desert environments. Brown, L.S. 1931. Cap-rock petrography. Bull. American Association of Petroleum Geologists,, 15, 509-522. Brown, P. R. 1963. Algal limestones and associated sediments in the basal Purbeck of Dorset. Geological Magazine,, 100, 565-573. Brown, P. R. 1964. Petrography and origin of some upper Jurassic beds from Dorset, England. Journal of Sedimentary Petrology, 34, 254-269. Butler, G.P. 1970. Holocene gypsum and anhydrite of the Abu Dhabi sabkha, Trucial Coast: an alternative explanation of origin. In Proceedings of the 3rd. Symposium on Salt, Rau, J.L. and Dellwig, L.F. (eds.- (Cleveland, Ohio : Northern Ohio Geological Society), vol. 1, 120-152. Damon, R. 1884. Geology of Weymouth, Portland and the Coast of Dorsetshire, 2nd ed., Weymouth. Folk, R.L. and J.S. Pittman. 1971. Length-slow chalcedony: a new testament for vanished evaporites. Journal of Sedimentary Petrology, vol. 41, pp. 1015-1058. Friedman, G.M. 1965. 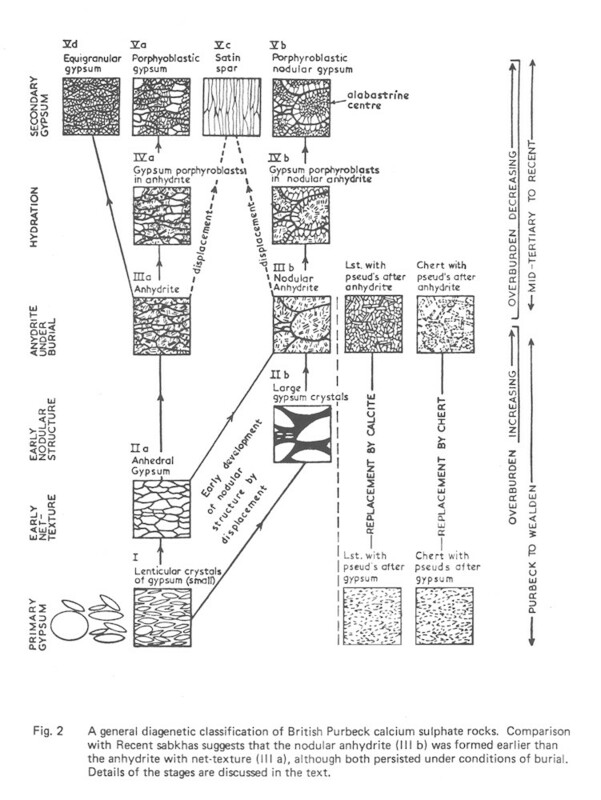 Terminology of crystallization textures and fabrics in sedimentary rocks. Journal of Sedimentary Petrology, vol. 35, pp. 643-655. Holliday, D.W. 1970. The petrology of secondary gypsum rocks: a review. Journal of Sedimentary Petrology, vol. 40, pp. 734-744. Holliday, D.W. 1973. Early diagenesis in nodular anhydrite rocks. Transactions of the Institute of Mining and Metallurgy, vol. 82, pp. B81-684. Holliday, D.W. and E.R. Shephard-Thorn. 1974. Basal Purbeck Evaporites of the Fairlight Borehole, Sussex. Report of the Institute of Geological Science, [British Geological Survey], No. 74/4. 14 pp. Hollingworth, S.E. 1938. The Purbeck Broken Beds. Geological Magazine, vol. 75, pp. 330-332. Howitt, F. 1964. Stratigraphy and structure of the Purbeck inliers of Sussex (England). Quarterly Journal of the Geological Society, London, vol. 120, pp. 77-113. Kinsman, D.J.J. 1969. Modes of formation, sedimentary associations, and diagnostic features of shallow-water and supratidal evaporites. Bulletin of the American Association of Petroleum Geologists, vol. 53, pp. 830-840. Lacroix, A. 1897. Le gypse de Paris et les mineraux qui l'accompagnent. Nouv. Arch. Mus. Hist. Nat., Paris (ser. 3), vol. 9, pp. 201-296. Larsonneur, C., Horn, R. and J.P. Auffret. 1974. Geologie de la partie meridionale de la Manche centrale [central English Channel]. Bull. du B. R. G. M. (deuxieme serie), section IV, no. 2-1974, pp. 99-105. Masson, P.H. 1955. An occurrence of gypsum in south-west Texas. Journal of Sedimentary Petrology, vol. 25, pp. 72-77. Peterson, M.N.A. and C.C. von der Borch. 1965. Chert: modern inorganic deposition in a carbonate-precipitating locality. Science, vol. 149, pp. 1501-1503. Pugh, M.E. 1969. Algae from the Lower Purbeck limestones of Dorset. Proceedings of the Geologists' Association, vol. 79, pp. 513-523. Salter, D.L. and I.M. West. 1965. Calciostrontianite in the basal Purbeck Beds of Durlston Head, Dorset. Mineralogical Magazine, vol. 35, pp. 146-50. Shearman, D.J. 1966. Origin of marine evaporites by diagenesis. Transactions of the Institute of Mining and Metallurgy, vol. B.77, pp. B.208-215. Shearman, D.J. and J.G. Fuller. 1969. Anhydrite diagenesis, calcitization, and organic laminites, Winnipegosis Formation, Middle Devonian, Saskatchewan. Bulletin of Canadian Petroleum Geology, vol. 17, pp. 496-525. Shearman, D.J., G. Mossop, H. Dunsmore and H. Martin, 1972. Origin of gypsum veins by hydraulic fracture. Transactions of the Institute of Mining and Metallurgy, vol. B.81, pp. B.149-155. Spry, A. 1969. Metamorphic Textures. Oxford, 350 pp. Taitt, A.H. and P.E. Kent. 1958. Deep Boreholes at Portsdown (Hants.) and Henfield (Sussex). British Petroleum Company Limited, London. Walter, H. 1973. Vegetation of the Earth. Translated from 2nd German Edition by J. Wieser. The English Universities Press Ltd. London, 237 pp. West, I.M. 1964. Evaporite diagenesis in the Lower Purbeck Beds of Dorset. Proceedings of the Yorkshire Geological Society, vol. 34, pp. 315-330. West, I.M. 1965. Macrocell structure and enterolithic veins in British Purbeck gypsum and anhydrite. Proceedings of the Yorkshire Geological Society, vol. 35, pp. 47-58. West, I.M. 1973. Vanished evaporites � significance of strontium minerals. Journal of Sedimentary Petrology, vol. 43, pp. 278-279. West, I.M. 1975. Evaporites and associated sediments of the basal Purbeck Formation (Upper Jurassic) of Dorset. Proceedings of the Geologists' Association, vol. 86, pp. 205-225. West, I.M., Brandon, A. and Smith, M. 1968. A tidal flat evaporitic facies in the Visean of Ireland. Journal of Sedimentary Petrology, vol. 38, pp. 1079-1093.